As a first generation college student, Michael knows he has to put in extra effort to fulfill his dream of one day becoming a neurologist. 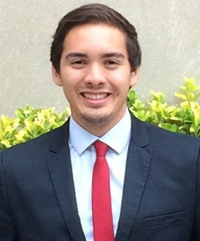 A rising sophomore at Arizona State University (ASU) pursuing a bachelor’s degree in biomedical engineering, this future physician-scientist is involved on campus and has participated in several programs that have helped him become a well-rounded student. Michael is active within ASU and national organizations, taking on leadership roles within the National Association of Engineering Student Councils, the Biomedical Engineering Society, and the Fulton Student Council, a group of approximately 8,700 students whose focus is on engineering. He has also completed research at the Translational Genomics Research Institute in the Brain Tumor Unit as both a Helios Scholar and an Ivy Neurological Fellow. Going the extra mile is important for Michael. Over the past four years, he has been accepted into various prestigious science and research programs. Most recently he was accepted into the Gateways to The Laboratory Summer program at the Rockefeller University/Memorial Sloan Kettering Cancer Center in New York City. This program selected 15 students from across the country for a 10-week program to learn about the challenging and intensive journey of becoming a physician-scientist. During this program, Michael is working under Dr. Christopher Mason, creator of the PathoMap of New York City Subways. Michael has aspirations of studying oncology or neurology and pursing a MD/PhD. In addition to being a part of a small percentage of Latino doctors, he hopes have published various accounts on his research and serve as a resource to other up and coming physician-scientists. The CHCI familia is proud of all Michael has accomplished and is excited to support his educational journey.